Vision: Acknowledged as the national leader in serving a region through theatre. Mission: To create and produce professional theatre productions, programs and services of a national standard. We make a commitment to excellence. Our challenge is to demand from ourselves the highest level of achievement in all areas of the theatre. We will take risks for the opportunity to do something astonishing. We produce work that celebrates the human experience. The purpose and power of the theatrical event have always been to come together in the theatre and discover a new understanding of ourselves. As the cultural fabric of our community becomes more diverse, we must now learn about each other as well. We create art of a national standard. By developing new plays, re-imagining the classics and promoting innovation in all areas of the theatre, Geva will help shape the American Theatre of the twenty-first century. We dedicate ourselves to a collaborative art form. Artists, staff and patrons will always find a supportive home that values and nurtures imagination, exploration and trust. We serve our community through education and outreach. Our responsibility as a resident theatre means providing opportunities, both within and without our walls, for all residents of the Rochester region to learn about and to experience professional theatre. We will provide exceptional service to our patrons and artists. Investing time and resources in the people of Geva – patrons, artists and staff – we will develop internal and external relationships for institutional sustainability through a service focus. We achieve our mission in a fiscally responsible manner. Every artistic decision is a financial decision, and every financial decision is an artistic decision. As one of the country’s leading not-for-profit, professional theatres, Geva Theatre Center is Rochester’s flagship theatre company and the most attended regional theatre in New York State. Founded in 1972, Geva serves up to 160,000 patrons annually, including more than 16,000 students. Geva’s productions are created and rehearsed in and for Rochester. Geva draws upon the talents of the country’s top actors, directors, designers and writers who are shaping the American theatre landscape. Geva Theatre Center operates two venues in downtown Rochester. The 552-seat Elaine P. Wilson Stage is home to Geva’s six-play subscription series featuring a wide variety of performances, from musicals to American and world classics. For nearly 25 years, Geva has presented Rochester’s holiday tradition – A Christmas Carol – in this venue. The 180-seat Ron & Donna Fielding Stage is home to Geva’s own series of contemporary drama, comedy and musical theatre; Geva Comedy Improv; Geva’s New Play Reading Series and the Hornets’ Nest – an innovative play reading series facilitating community-wide discussion on controversial topics. The Fielding Stage also hosts visiting companies of both local and international renown. 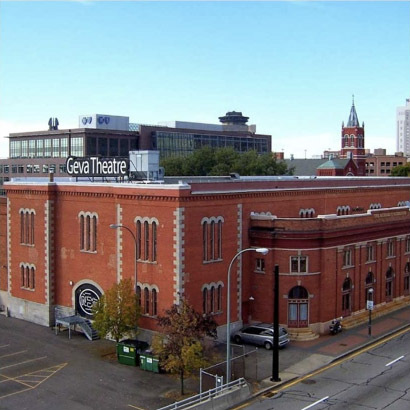 Geva Theatre Center presents approximately 500 performances and events per year. From the Wilson Stage and Fielding Stage to the classroom and beyond, Geva Theatre Center is an active member of the Rochester cultural community, offering a multitude of opportunities for our community to experience the transformative power of national level theatre and programs. Click here to view the full Geva Production History. Click here to view Geva’s 2016-2017 Annual Report.